How large do you let your students draw? There are benefits to taking a small image and replicating it on a much larger scale. Whether we are preparing students to draw a mural, or just having students experience drawing in a different way, large-scale drawing is important. Using a grid can be essential in guiding this investigation. Here are a few reasons you should consider having students practice drawing in feet as opposed to inches. Large-scale drawing (several feet in dimension) does not always need a grid. For the technical training and benefits large-scale drawing can provide students, this article focuses on using a grid. A grid can be designed in countless ways. Many people prefer the checkerboard style of a grid where the composition is broken down into several equal-sized rectangles or squares. Other grids might have differing size shapes within the composition. Regardless of the style of grid being used, grids are a method to guide the transfer of small to large imagery. A key area for art educators to construct a grid for practicing drawing large-scale is on the front board. Most of us have some sort of a board, whether it is a chalkboard or a dry erase board, on which to create a grid. 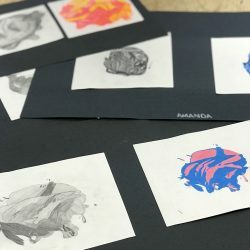 As long as students are drawing an image from a piece of paper, such as a photocopy or a printout, a grid can be applied on the image and the board for large-scale practice. Murals are painted drawings with dimensions measured in feet. 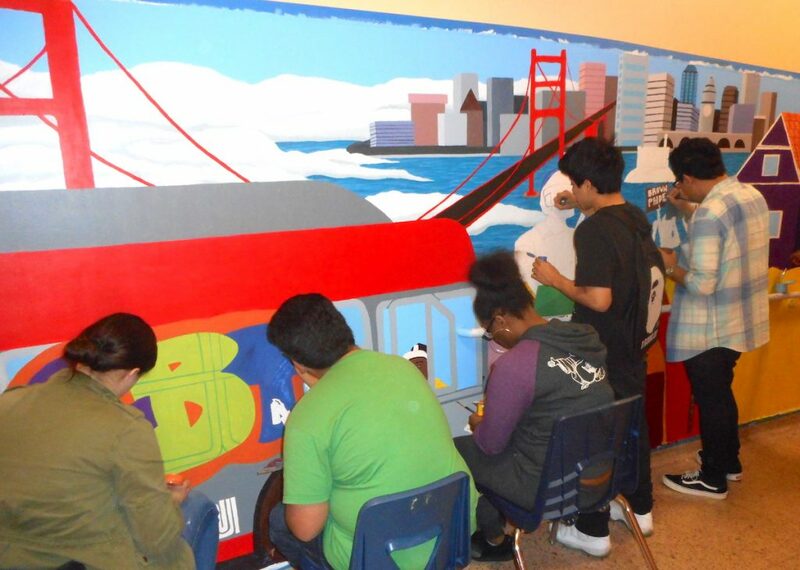 Not only are murals a profound way for students to collaborate and create dynamic work, murals provide a lasting legacy to inspire generations to come. Murals are also challenging to execute, especially with students. One struggle murals present is the absolute necessity to transfer a small sketch onto a large surface. Transferring imagery from inches to a drawing in feet takes practice. 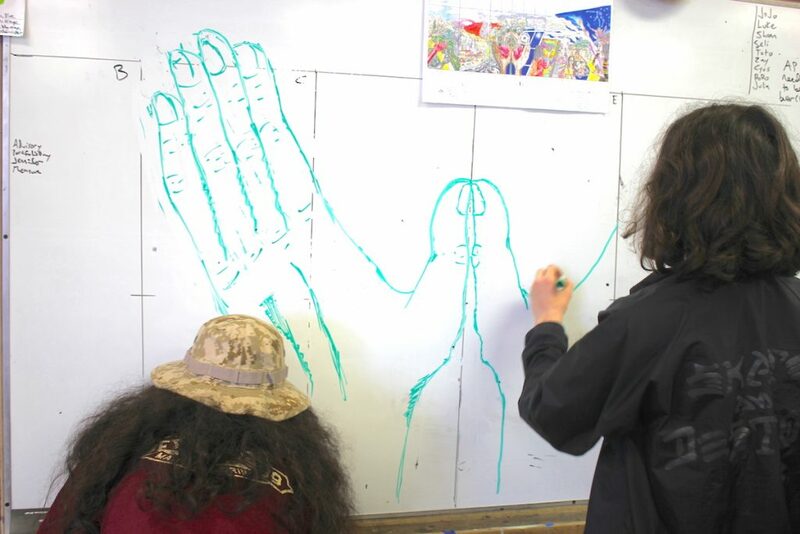 Before beginning a mural with students, have them take turns drawing one part of the mural in proportion to the sketch on your board. Take one part of the mural design and replicate the proportional grid for that specific area on the board. Then have students practice drawing one image at a time. Practicing drawing some of the imagery in larger scale before hitting the actual mural wall will help immensely. When drawing complex compositions, one strategy is to map out the larger shapes of images first and then focus on the details later. Students do not always grasp this concept, especially when they are drawing on small surfaces. When students are asked to draw something in large dimensions, it is a new challenge. This task requires students to plot out where their general, larger shapes are going to go first. Drawing on the board and using a grid for guidance can help students internalize this concept. 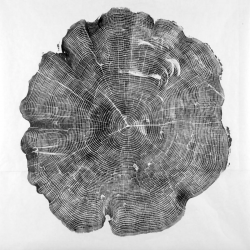 Large-scale drawing is out of many students’ comfort zones. Mapping out the main shapes of an image before jumping right into the details is a method that is much more easily appreciated and understood when students practice in large-scale. Large-scale drawing requires different body posture and movement. When drawing on the front board, students are standing. The back, legs, and arms are free to move about and can become more significant players in the drawing process. 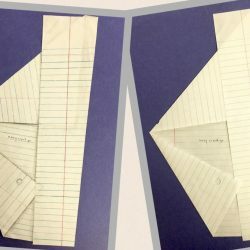 For those students who are cramped at their desks and need more motion, drawing something on the board in large scale for a while can help them become grounded. Students are often quick to dislike their work after they have stared at the small details up close for too long. Fixating on one specific area of a work they have been straining their eyes on can create a negative sentiment toward the work as a whole. While it is always a good practice for students to step back and look at their work from a distance, the same principle applies to drawing on a large scale. When students draw large, they have to step back. It can be difficult to get a sense of the image being drawn if the image is six feet wide. When drawing large, students can better understand the nature of the art will change by creating space between the viewer and the piece. They can take this practice to any size work they are doing as a way to get a more holistic perspective on their progress. Students do not always get a lot of practice drawing in large-scale. Classroom constraints can often confine works to less than two feet in dimension for numerous reasons. However, students deserve an opportunity to think big. Large-scale drawing gives students a new opportunity to engage in works that communicate to an audience. Besides having other artistic benefits, large-scale drawing can be the first time a student does work that can be in billboard proportions. While some might not think drawing large is that big of a deal, there are good reasons for it. Students are impacted by different artistic experiences in different ways. For some, large-scale drawing might be a challenge helping them appreciate the smaller work they do. For others, drawing large can ignite a new passion for designing on that scale. It can lead students to become architects, Hollywood set designers or even muralists. If we are telling students to “think big” and “dream big” all the time, perhaps we should also give them an opportunity to draw big as well. How large do you draw with students? What other benefits do you see to large-scale drawing? 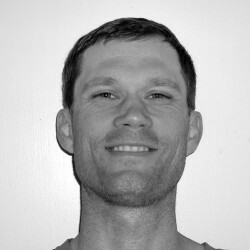 Matt is a high school visual arts and mural design teacher in San Francisco, CA who strives to cultivate maximum creative potential in all students. I pretty much practice the mantra go big or…go take choir! ? just kidding! In my art room drawing big gives so many benefits to a project. I use many approaches but I always include grid techniques. If you’re drawing large you now have lots of room to make mistakes (which is great! )…and be able to easily erase the lines you don’t want, but still leave the lines you do want. Smaller drawings mean erasing good lines accidentally because they are too close to the yucky lines (if that makes sense). Also, it is all about seeing simple shapes in complex images which allows a student to know where to start with a drawing. I have them begin simple grids with 6 or 9 squares and a photocopy. We use a highlighter to see just the big simple shapes first and ignore the rest. We grid those then start adding the additional shapes and lines and suddenly, whammo, you’re golden! It also reinforces math and ratios in art. They are critical if you’re enlarging an image without distortion. And my fav…now you can have room for the juicy details! And you have more space to explore medias when you’ve got lots of space. Plus, big is so out of their comfort zones but when you demystify the process it adds so much to their drawing confidence. It’s awesome!! Excellent post, sir! matt, thank you for your time with AOE. As a new HS art educator, I found your articles so right on and helpful. Thank you again.